The beauty of working with Drummer is that it is easy (and fun) to have the part dynamically change by dragging the puck, sliders, and knobs around in the Drummer Editor. But once you have established your part, converting to MIDI will “lock it in” from any further changes to the actual performance itself. I find this a very useful way to lock in fills and ghost notes once you’ve got them the way you like them. Because further alterations within the Drummer Editor will change them. Although once converted to MIDI, the Drummer part is locked in. 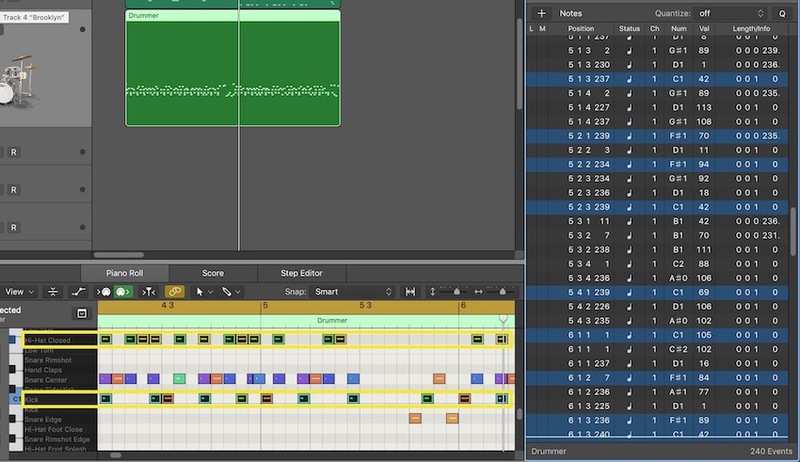 But now the world of MIDI editing is open to you for further tweaking. So once you have the Drummer region parameters set to your liking, right-click (or Control-Click) on the region in the Main area to bring up the contextual menu. Once there, navigate to the Convert menu, and choose Convert to MIDI. Doing this converts the Drummer data into regular MIDI information. As such, it can easily be edited in any of the MIDI editors. 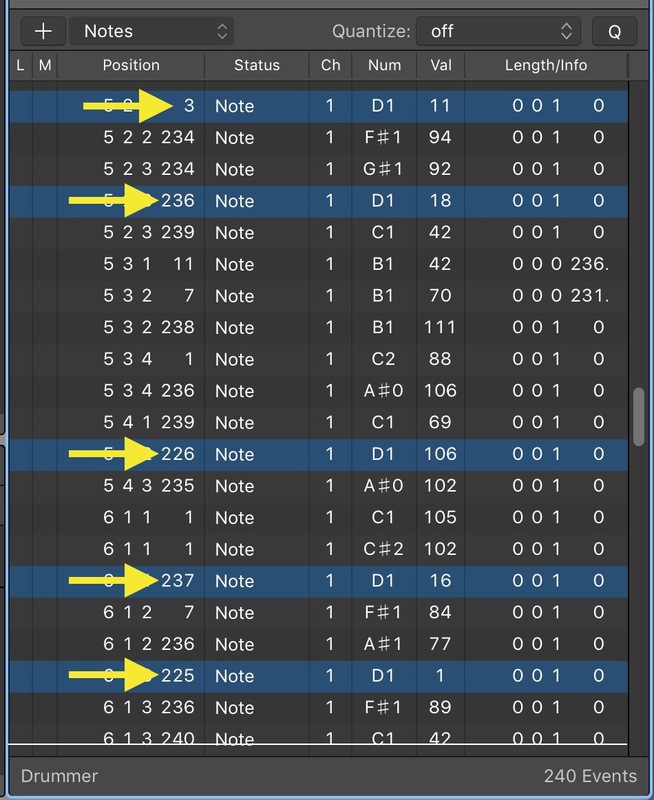 I find using the Piano Roll Editor and Event List together to be the most useful for the purposes of editing the timing positions of all hits of a specific drum kit piece. With your newly created MIDI region selected, press P on your keyboard to open the Piano Roll Editor at the bottom of your screen, and D to open the Edit pane on the right. Click on the Event List tab in the Edit pane if it isn’t already the selected tab. To select all note events of a specific drum kit element, simply click on the corresponding key on the vertical access at the right of the Piano Roll Editor. All note events triggering that kit piece will be selected in both the Piano Roll Editor and the Event List. In this example, the snare hits are selected. At this point, offsetting the start position of the selected notes is a simple matter of mouse sliding the start position of any of the selected events in the Event List. Changing one value will edit all the selected notes similarly. So for example, if you want the selected snare hits to be ahead of the beat, simply drag the start position back a few ticks. Now your snare is ahead of the beat while the rest of the kit is maintaining the original groove and feel. In this way, you can easily customize the feel of the individual kit piece elements within a Drummer groove. If you want to alter multiple elements simultaneously, simply shift click on the Piano Roll Editor’s vertical legend to select multiple lanes. In this example, the hi-hat and kick drum notes are selected. They can be shifted together in the same way in the Event List. Simply mouse slide the start position of one of the selected events, and they will all move by the same amount. And while we’re at it, offsetting the velocities of the selected kit piece elements is a simple matter of using either the slider in the Piano Roll Inspector or mouse sliding the velocity value of one of the selected events in the Event List. For example, I often find the hi-hat velocities in the Drummer grooves a bit too low for my liking. Clicking on the corresponding label in the vertical legend and mouse sliding the velocity slider changes them all at once. And all of these techniques work the same on multiple regions when multiple regions are selected in the Main Window. Clicking on the note labels in the Piano Roll Editor will select all similar events in all the selected regions. With these techniques, customizing Drummer grooves to the feel of your music is simple. And the beauty is that once converted to MIDI data, this type of editing is completely nondestructive. If you decide later you don’t like some of the changes. Simply reselect the kit piece elements and move them again to get them closer to the pocket you are looking for.